Welcome to post #2 of the big Kitchen Reveal week here at 1915 House! If you missed the first post, you can read it here. Our house came with a really old dishwasher. Really old. As in, it was purchased and installed in the mid 80’s. Which – as you’ve probably already figured – makes it approximately 30 years old. Pretty old for an appliance. 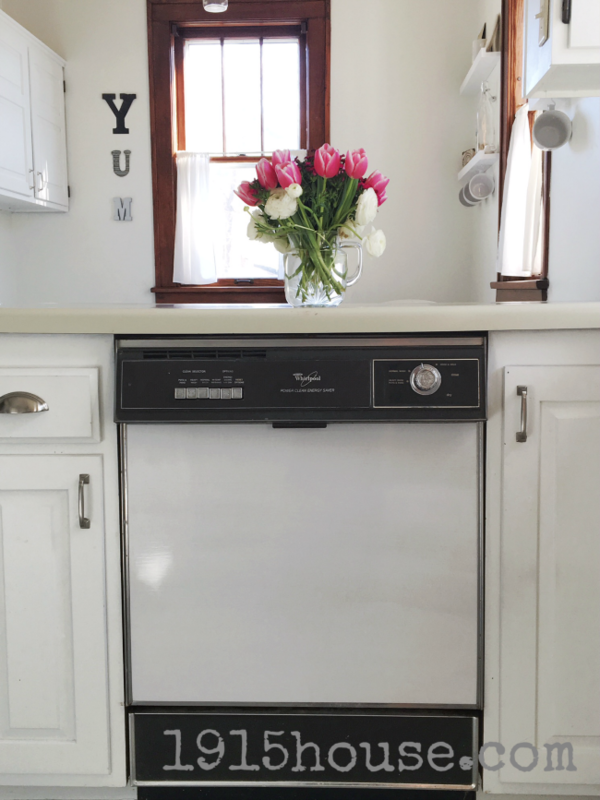 You’re probably thinking, “That dishwasher needed to be replaced when you replaced your fridge!” And maybe you’re right, but here’s the thing…I love this old dishwasher. I really do! It’s a little noisy and I’m sure it’s not an energy & water efficient model – and it’s an ugly beige color. (blech) But boy, does it do a great job on our dishes! In our farmhouse, before we moved here, we went through two newer dishwashers. They were quieter, and more energy & water efficient- and prettier, but they did a horrible job getting dishes clean. We basically had to pre-wash all the dishes before loading the dishwasher. Which, if you have to do that, what’s the point, right? My thoughts exactly. I remember looking at this old dishwasher when we were going through the house on our final walk through and asking the previous owner if “that thing” still worked, fully expecting him to say that they hadn’t used it in years, and was mildly surprised when he said that it had worked for them when they were still in the house. (They had been out of the house for 9 months by that time). I basically just nodded, smiled and moved on – thinking that we’d be replacing it within a few weeks of moving – I was sure it was going to function as badly as it looked. 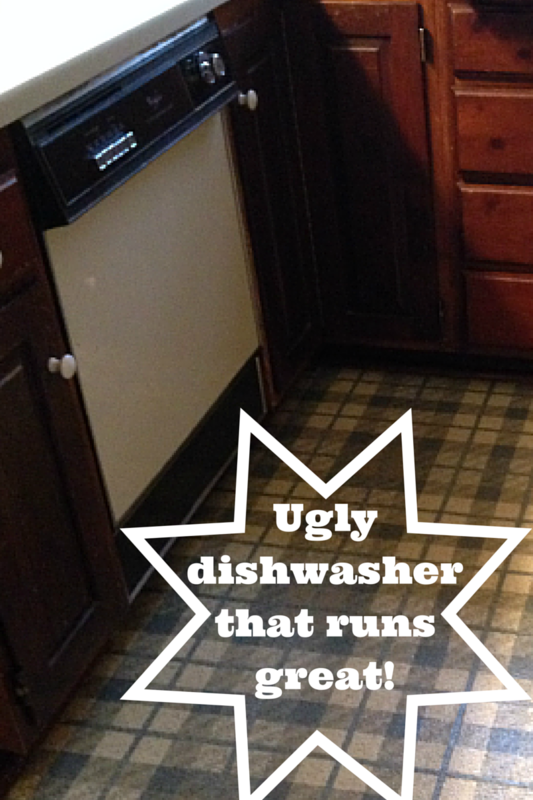 Old, ugly dishwasher…Time for a facelift! Now, while it is still far from looking like a new machine (I do realize this), it DOES look better than it did in it’s dingy beige color. And it still runs like a dream and cleans our dishes so I don’t have to. 😀 And THAT makes me happy. 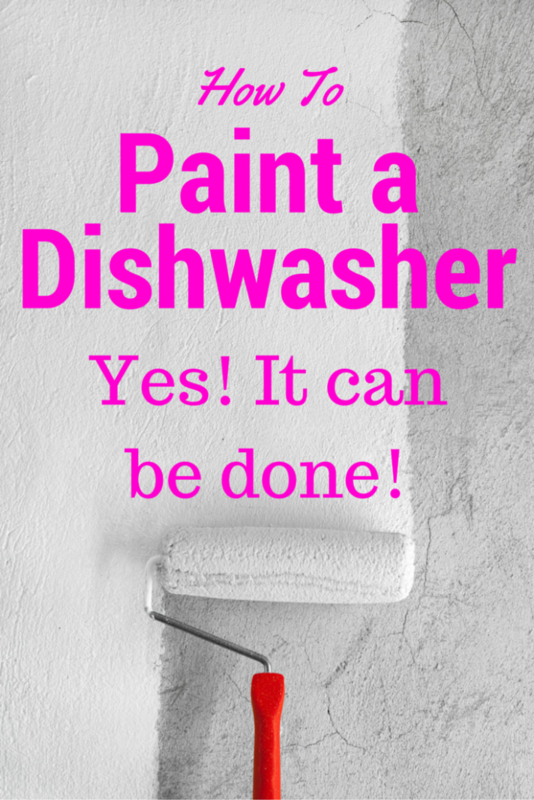 Don’t forget to pin and share, if you found this helpful- 🙂 Have you ever painted an appliance before? I’d love to hear in the comments below! They don’t make appliances like they used to so why not hold onto what works? What a great update that now looks beautiful in your updated kitchen. I’m so proud of the changes you’ve made in your once very outdated kitchen to a fresh and beautiful space! I had no idea you could paint that! You’re going to have me paint all the things, friend! I love how it turned out and freshened it up! 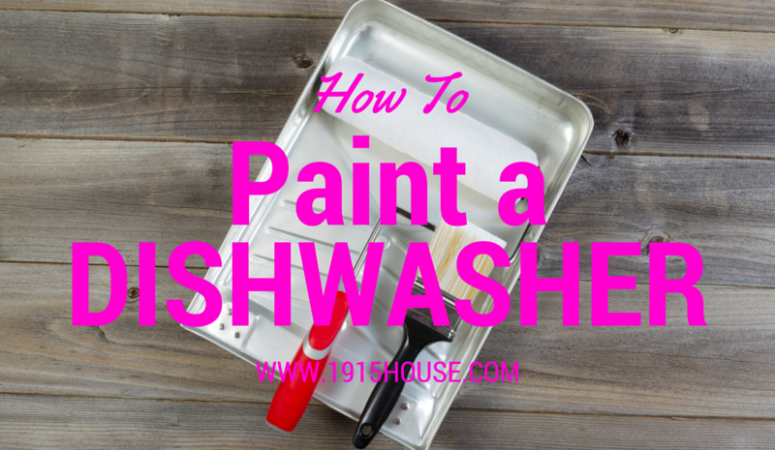 This is so awesome and I am going to paint my dishwasher!! !